This 11,000 square foot, 259,000 gallon zero entry pool is DESTIN’S LARGEST LAGOON POOL! This lagoon pool features a childrens area with 5 dancing waterfalls and a mini pool. Walking bridges, heated pool, and hot whirlpool spa set the tone for a tropical oasis. 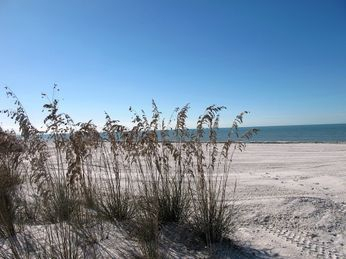 The worlds GREATEST beaches are located just across Hwy 98. Take a walk down sugary white sands, watch the sun disappear into the tranquil Gulf wates, and then bask in the moon’s luminous reflection on the sea. Whether a short weekend getaway for family vacation of the year Destin beaches are the place to be. Kid friendly amenities makes the resort a great place for family vacations! The Palms of Destin offers a full size basketball court and two lighted tennis courts. state- of- the- art fitness center equipped with cardio equipment including ellipticals, treadmills, cross trainers, bikes and summit trainers each having a personal entertainment system. There is also a line of premier circuit strength training equipment and free weight area. Dine under the palms, Sago Sports Bar and Grill offers a selection of favorite foods with casual exterior or interior seating.